On May 10th, the first Exposition on China Indigenous Brand, together with International Forum on China Brand Development hold at the Shanghai Exhibition Center, As one of excellent brand representatives of Hubei province, Angel Company attended this exposition. On May 10th, the first Exposition on China Indigenous Brand and International Forum on China Brand Development hold at the Shanghai Exhibition Center, were hosted jointly by The National Development and Reform Commission, the Propaganda Department of the Central Committee of the CPC, China’s Ministry of Industry and Information Technology, China’s Ministry of Agriculture and Rural Affairs, China’s Ministry of Commerce, State Administration for Market Regulation, State Intellectual Property Office and Shanghai Government. 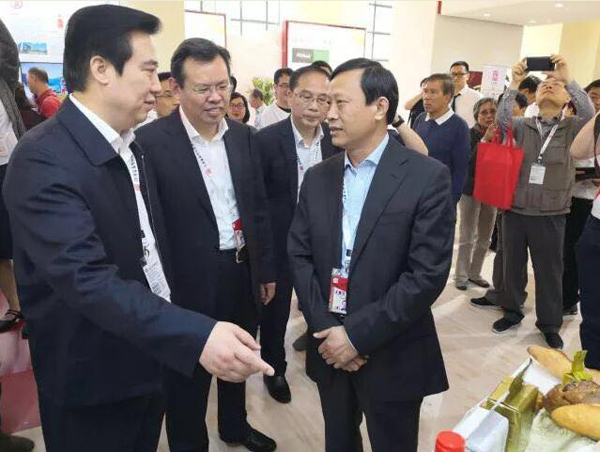 As one of excellent brand representatives of Hubei province, Angel Company attended this exposition. The aim of holding the Exposition on China Indigenous Brand is to show China’s achievements of brand development, enlarge the publicity and influence of the brand, foster good brand images, build concept of economic development of Chinese brands, promote consumption, build strong Chinese brands, and furthermore to meet people’s needs for better life. This exposition with the theme of “China brand, world sharing”, provides limited numbers for the exhibitors. The company who attends this expo must be indigenous brand and in good condition in main business, industry influence, brand awareness, credit status and proprietary intellectual property rights. After strictly selection by National Development and Reform Commission, 22 companies of Hubei Province have the honor to attend this expo. Angel Company, as an international brand with high publicity and influence, one of the ten top companies who registrated the Madrid International Trademark, candidate for the most valuable brand in China with two trademarks –Angel and Fubon well-known in the world, and with Angel Nutritech wining the praise “One of Ten Public Trust Brands of Chinese Health Care Products”, is also gained the qualification to attend this expo. It is reported that, the International Forum on China Brand Development hold at the same time, aims at building an exchange platform, creating a good atmosphere for brand development, forging a new image of China’s brand development, strengthening the momentum of development, building concept of brand development and promoting pragmatic cooperation between China and other countries. In order to implement President Xi’s socialist ideology with Chinese-featured in new era and the spirit of the 19th National Congress of the Communist Party of China, better play a brand leading role, accelerate the optimization and upgrading of supply side structure, lead the optimization and upgrading of demand side structure, provide a driving force for economic development, the State Council published a document named “the suggestion for playing brand leading role and accelerating the upgrading of supply and demand structure” in June, 2016. The document indicates that it is in need to build a “China Brand Day”, and to promote indigenous brand, improve brand influence and publicity. Therefore, May 10th was made to be China Brand Day.